The press is buzzing with stories about Earth Day and everywhere there's talk about the hottest eco products everyone should have to live green. Lavish & Lime has been lucky enough to be featured in some of our favourite media outlets and – at the risk of blowing our horn – we'd like to share them with you, if only to show you we're not the only ones that think these products are wonderful! Westcoast Homes & Design featured our eco shopping basket as a garden trug. "Fashioned from recycled newspaper, these colourful O’bon pencils last 2-3 times longer than traditional wooden pencils because the leads are better protected. They also manage to inspire awe for the wild in your child, with each pencil showcasing a different animal that corresponds to a particular colour. We love their bright hues. From $2.50 at www.lavishandlime.com"
"Clean Well: AspenClean Grapefruit & Lavender All Purpose Natural Spray Cleaner & Eco Cloth SetVancouver-based AspenClean’s 100% vegan cleaning spray won’t leave toxic residues on countertops but will leave your house—and the air you all breathe in—smelling beautiful with the scents of lavender and grapefruit. Given the esteemed Ecocert certification from Europe, this cleaner is an example of tough, biodegradable all-natural cleaners at their best. $18, available at lavishandlime.com"
It’s hard to keep kids away from plastic, particularly when it comes to playtime. But in the craft department you can clean things right up. Consider these recycled pencils that are made thick so they’re easier for smaller hands to grab a hold of. Tip: When buying pencils or pencil crayons, look for the FSC-certified wood symbol which means the product has come from sustainably managed forests and that neither wildlife, soil or waterways were harmed during the harvesting process. $10.80, available at lavishandlime.com"
"Eco Basket. 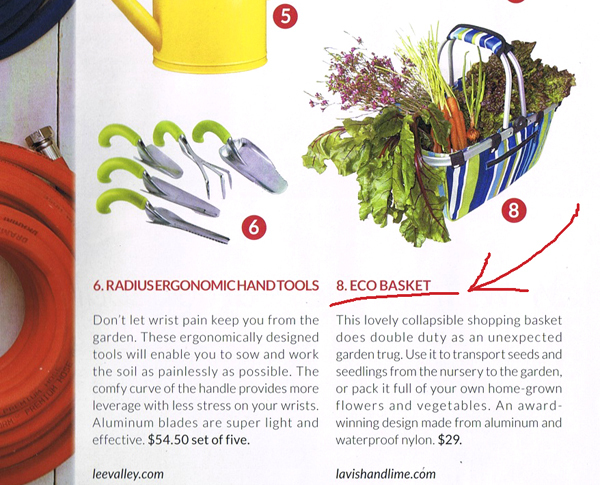 This lovely collapsible shopping basket does double duty as an unexpected garden trug. Use it to transport seeds and seedlings from teh nursery tot he the garden, or pack ti full of your own home-grown flowers and vegetables. An award-winning design made from aluminum and waterproof nylon. $29 lavishandlime.com"